Latest savings from Shaws valid 2/16 – 2/22/2018: $1.66 lb Boneless Chicken Breast or Thighs; $2.99 Shady Brook Farms Ground Turkey; $1.88 Blueberries 6 oz. Blackberries 5.6 oz. ; 2/$5 Romaine Hearts 3 pack Grape Tomatoes pint Mini Peppers 8 oz. ; $5.99 lb Dietz & Watson American Cheese; $4.99 Freschetta 12 Inch Pizza; 10/$10 Chobani Greek Yogurt; 4/$10 Stouffer’s Entrees; 10/$10 Bumble Bee Solid White Tuna; 2/$5 Florida’s Natural Orange Juice; 3/$8.88 Pepsi; $9.99 Tide Laundry Detergent 92-100 oz. Tide Pods or Gain Flings 42 ct.; 2/$5 Nabisco Oreo; B1G1 free Campbell’s Chunky Soups; B1G1 free Keebler Crackers; B1G1 free Birds Eye Vegetables or Dole Organics Fruit; B1G1 free Signature Home Storage Bags; B1G1 free Kozy Shack Pudding; B1G1 free Green Giant Boxed Vegetables; B1G1 free Entenmann’s Little Bites; B1G1 free Sheila G’s Brownie Brittle; and more. 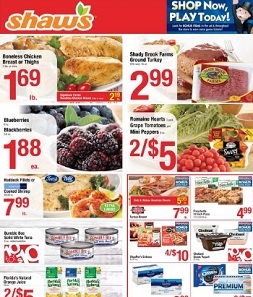 Find all deals and offers from every category, in the latest Shaw’s Weekly Ad for your local store.